USD eases in corrective mode after advancing six days in-a-row. Fed's Powell set to speak later today, although little chances of fresh monetary policy clues. 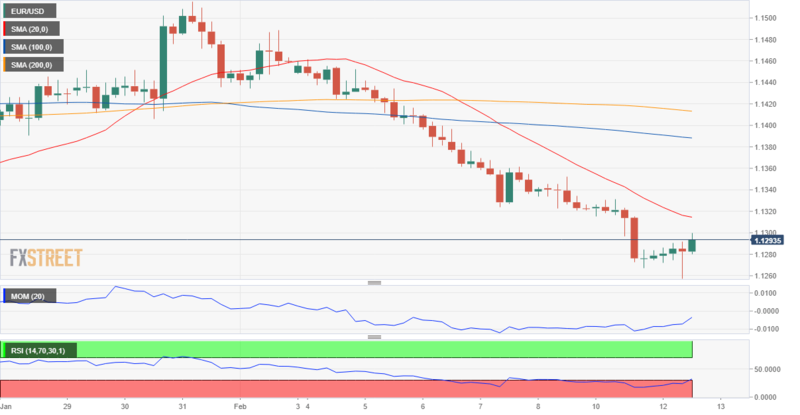 The EUR/USD pair is trading modestly up daily basis, following a six consecutive days' decline and after hitting during the European session a new 2019 low of 1.1257. The shared currency can't lift its head ever since different organism downgraded their growth forecasts for Germany and the Union. Dollar's decline at the time being seems corrective, as political news from the US are so far encouraging. Regarding the trade war front, a US delegation led by Treasury Secretary Mnuchin arrived in China to continue trade talks later this week. Mnuchin said that they are “looking forward to several important days of talks.” Also, the US Congress agreed on a spending package to maintain the government open beyond the 3-week term agreed last month, which ends this Friday. The macroeconomic calendar remains scarce, with no relevant data released in Europe, while the US released the NFIB Business Optimism Index which fell in January to 101.2 from the previous 104.4, adding to dollar's downward corrective movement. The Fed's head, Jerome Powell, will deliver a speech titled "Economic Development in High Poverty Rural Communities," and despite odds are few, he could make comments on monetary policy.